Back in the late 1970s, our two bedroom, one-bath apartment in Adelphi, Md., was always rocking. Yes, Twenty, Aggo and I were eyebrows deep into two years of hard university time within those walls in the cockroach-inhabitated complex we used to lovingly call Residential Plaza, dropping their officious P from the first name because that it surely wasn’t. Studying, though, was reserved for the libraries and lounges and classrooms a couple miles up the busy suburban roads to the College Park campus. That’s where we spent our days and a good portion of the early evenings, too, attending courses to get our bachelor’s in journalism after transferring down from the tiny upstate State University of New York at Morrisville two-year college to the humungous University of Maryland. After the classes ended, we’d work at the daily campus newspaper, the Diamondback, covering sports teams and editing stories and laying out the section. Aggo puts on an album in Adelphi, Md. But once home, to these smallish rooms with the bugs who scattered under the kitchen appliances once you flipped the light on, we were overjoyed. At Morrisville we’d all lived in dorm rooms way smaller, eaten meals from trays in the dining halls, showered, brushed our teeth and accomplished all that business en masse in dormitory wings big enough for dozens. This was the life. Even after Twenty’s older brother Rick — Termite to keep the nicknames going — moved down from New York, too, got a job and made us four. We played the stereo, always, as loud as we dared without drawing knocks from the neighbors. It was mine, and the brand was Technics. The speakers were from a company named Becker. 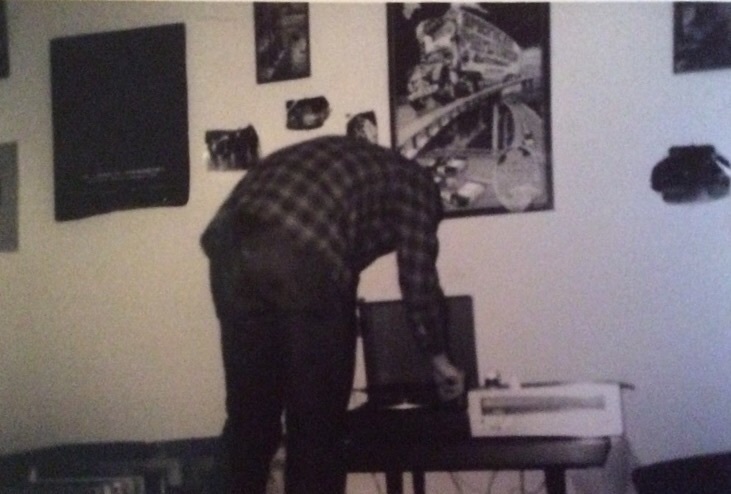 At Morrisville, when the weather turned warm for two or three days in May, I’d stack both in the lone room window, and crank my music out across the quad, and the Beckers boomed it far from my Stewart Hall and past Twenty’s West and to the girls’ Helyar, where I wanted them to be heard the most. Visitor Zanne gets an important position. And this was a prime time for Southern Rock, so we really got into the guitar work of the Outlaws. “Green Grass and High Tides” was a blistering favorite, because we’d seen them play live in Hamilton Hall the year before in Morrisville. “This Old Cowboy” and “Twenty-Four Hours at a Time” from the Marshall Tucker Band had our hearts. We were destined to see them come spring at Merriweather Post Pavillion just north apiece. 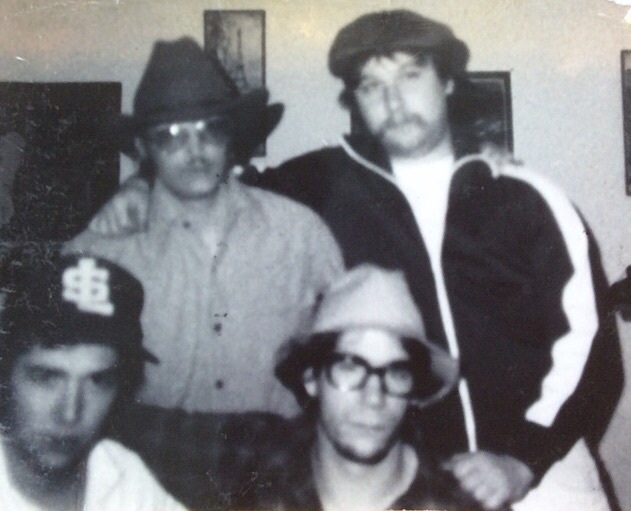 Then one night we decided if the four of us were going to be a band, we’d call play Southern Rock, bowing to Huey Thomasson of the Outlaws and Doug Gray of Tucker and CDB’s Charlie Daniels his own self. Hell, we’d call ourselves Cattle Crossing. I’d gotten a camera for Christmas, and it was loaded with black-and-white film. Cattle Crossing is, clockwise from top left: Term, Bialz, Aggo and Twenty. I handed it to our friend Suzanne — Zanne, to us then — and told her that she had the honor of taking the photo for the Catttle Crossing album cover. Staff photographer! I decided I was the drummer. I played nothing. In fact, none of us played a lick of a thing. But my father was a drummer in a polka band on Long Island, a weekend warrior for wedding receptions and other big parties. I’d loaded his kit in and out of the family car since I was old enough to lift the bass drum. Besides, I was very percussive. I had dibs on the drums. I thought I had the drummer’s look down cold. Nobody ever argued that point after the picture came back. I carried this photo in my wallet for three decades. I’d like to thank my friend Marissa Bergen and her blog Glorious Results of a Misspent Youth. The Rock and Roll Supermom inspired this post with her poem Stupid of the Shrapnel Elevatorh. What was your favorite style of music and band when you were young? Did you ever pose for a fake album cover? If you were to start an imaginary band, what would you name it, and why? The Dangling Participles could cover “ABC” by the Jackson Five, Ann, off the top of my head. omg, i love this post. especially the album cover shot. we are working on a family music video called, ‘candy dish.’ i’ll keep you posted. Great memory. I never was in a band but I dated a guitarist from a garage band. Were we ever really this young? It seems like never and it seems like yesterday, Rose. Why I can remember the details from these days better than yesterday’s lunch? Thanks for sharing your memory of a guitarist and a garage band, my friend. Yes, it is indeed, if I must say so myself. Thanks again, Rose. You look like a young Mick Fleetwood. Could Do Worse, as blogging friend Rachel would say! I lived in Suitland, MD from 1970-1978 and worked in DC. Small world, isn’t it? “My father was a drummer in a polka band on Long Island.” That’s the first sentence of a book. Autobiography or novel, take your pick. My friends used to hate riding in my car (borrowed from Mom) in high school because I always had a cassette tape of big band music or The Ink Spots, or something equally uncool in the deck. I’m glad you like that one, Scott. 🙂 Lots of memories from dad Frank’s musical exploits for the book, or to extrapolate in the novel, that’s for sure. How about the fact that he pulled them out, set them up on our patio, and played solo for an hour at my high school graduation party? A real crowd-gatherer there, huh? Ooo! Ooo! Someone else who knew the Ink Spots! My folks used to play them all the time. Then, in one of those L.A. things, the son of an Ink Spot wound up as our dept. secretary. Scott had the Ink Spots in his cassette deck, and you worked with the son of an Ink Spot. Hell of a night for a journalism guy who wrote about a pretend band fake album cover, Babe! So glad I could be the inspiration for this one and thank you for the shout out. The band story for me is obvious but also recalls when my sister and I first moved to NYC and the girl who lived there before us didn’t believe in killing animals at all and called of the exterminator. The cockroaches (thankfully small) were so prevalent they never went away and would crawl all over us at all times including while we slept. Of course, we quickly got some of that fogging stuff and boric acid and, oh yeah, got the exterminator back in for the monthly treatments!! We sprayed, the bugs were gone for a bit. They returned, we sprayed … the cycle continued for the two years we lived in that apartment. Marissa. Yeah, we did the fogger and then put boric acid in our cleaner and they stayed away. Also, like I said, getting the exterminator back in for weekly treatments helped. Apparently that’s part of your rental package in NYC!! Good deal, Marissa. Back in the 70s, we were on our own with spray bottles of Raid. Oh yeah, it never occurred to me that those things were a wonder of modern technology!! That is hilarious. It may be grainy, but at least you have it preserved for posterity. Your would-be band, the Technics. There’s a JC Mellancamp lyric where he says, “The boys try to look so hard.” You all were doing a good job of that. So there was a dorm called Helyar? Or a hall? That sounds like “Hell, yeah.” Like an invitation to party. Hell-yeah Hall. I like that pronunciation you came up with, Kerbey! We actually said it Hell-Yer Hall, but it was still a pretty good party place for an all-girlls’ dorm. Get this: All boys were supposed to be out of the dorm by 11 p.m. No intervisitation. 🙂 Oh, the 70s in a State University school. Uh-huh. This was awesome. Cattle Crossing…too funny. Thanks for sharing! You had to pick that line to throw at me, didn’t you, Rachel! 🙂 RIP PSH. Yes, I liked learning more about you in college 🙂 Fun post and great to smile with you! I’ve never been musically inclined. That said, a friend of my was the original bass player for Metal Church. He plays blues and jazz now. And one of my former co-workers played in Iron Butterfly. And one of my favorite former neighbors was a disc jockey at a local radio station. Which means I live vicariously through other people’s music. Living vicariously through others’ music was Cattle Crossings’ best trait, so you fit right in with our band, Fannie! It was really funny when I found out he was part of Iron Butterfly. It was the aha moment when he was explaining how they wrote Inna Gadda Da Vida that I finally put two and two together. He got a really good laugh over it. Wicked. My fantasy band name was The Insensibles. Great name, Ross. Makes sense to me! That photo with you and your classic car would be a great classic rock album cover, Diana. And if you want to type yourself after a rock singer, my friend, you started at the top with Ann Wilson of Heart. That famous album got worn out during my SUNY Morrisville days, for sure. ‘Crazy on You’ and ‘Barracuda,’ well, how hot were they? Amazingly hot Mark! I’m still a fan of heart and LOVE their version of Unchained Melody. I believe this was recorded in 2002. Her voice – so powerful! Oh, my! JJ, you did it! The SPITunes!! Greatest name for a bunch of old chewers ever. Way to go, beat-keeper. I am so proud of you. That is just so awesome. I WISH I had the weekend free so I could buy the first round! Please deliver ample amounts of hugs and kisses for me, (and a salute for Old Man Keegan!) Very, very jealous! I will pass around your love and salutes, my friend. Oh, the good, old days. Mark, I believe you would have had great fans, would have also kept the beat well, and your photo is fantastic. Interesting title or band name. I wanted to add this funny maybe interesting fact: My son was invited to be a ‘cow bell’ ringer in a group called, ‘Tipping Cows.” It was a little too close of a name to yours to not at least let you know. What if they had been your introduction band, while you were the main event? Tipping Cows opening for Cattle Crossing. I can see it on the marquee now, Robin! How great an imagination for all of us. 🙂 Your son must be a great Cowbell ringer!! I don’t know which captivated me longer in my youth, Pink Floyd or Led Zeppelin. My love for Tori Amos caught me around 24 and she’s still my fave. But who can only listen to one type of music? The post, the comments, and your replies had me smiling the whole way through, Mark! See? I was practically onstage! That’s what I say! You’re welcome, Mark–As I was their inspiration, so you were mine! I never posed for a fake album cover. Yet. I’ll keep you posted. And this is great homage to Marissa’s piece. You could so so so be the drummer MBM. I think you are correct on both – but I know some of the older music because I had older siblings and just other exposures – and I dabble with musical instruments – but my hubs and sons are really the players around here. but if you ever make any fake cover photos again – I will get you some drum sticks to add to the mood. Hubs and sons should be ini some of your photos with band work, Y, album cover style! That could be a whole post for you. If my family men ever made an album, here’s my cover for them. 🙂 I know, your blog. Coolest of beans that Hubs is putting out a CD this month. Maybe I have earned a listen when it’s out in addition to a view of the cover of his work on your shot. Y? HIs call. I’d wrote honestly about it, natch. well I will email you – but dude – I will send you your very own copy. 🙂 -although I do want you to know it is a Christian themed CD – and I know that is not everybody’s cup of tea – but there is one guitar instrumental on there that I think you will love (I love it). anyhow, this is my hubs third CD and all three of his albums/CDs were not really passion projects – long story but especially this third CD – some of the songs have been hanging around for a couple of years and it was one of those projects that he needed to pull in all of the loose strings and finish finally – so he burned some midnight oil the last two months to get it done. I think Christian-themed music stands on its own, Y. Some of the best artists out there are in that genre. Have you and your hubs heard of Ceil Rain? It’s a Christian-themed Celtic-tinged pop-rock band that started 20 years ago in Nashville, by renowned singer-songwriter Bob Halligan Jr. Bob moved back to Syracuse and is a good friend of mine. Rick Cua is a Syracuse native who still lives in Nashville and was and is a big player in the Christian contemporary blues and more scene in the playing and label side. Oh, by the way, in the wayback, he was the bass player for a little Southern rock band by the name of the Outlaws. He’s a good friend of mine. I have been seen at Christian music concerts of many styles with my hands raised to the sky. I think that may answer your question about my acceptance of the style. OK, you know me and my stories. So the night before the notorious Labor Day storm here, I was reviewing the final grandstand concert at the State Fair. It’s a big Christian rock show, 6,000 or so fans for Jars of Clay and more. I write my review at the media building, drive home, wake up to the sight and news of the cyclonic windstorm that knocked so much down in the path from the fairgrounds to my backyard 35 miles east, including the huge trees between my house and my neighbor’s. Somebody camping in an RV at the fair was killed by falling debris. I was convinced that the Christian show had something to do with that storm’s timing coming a couple hours after the 90,000 people that Sunday were back home. 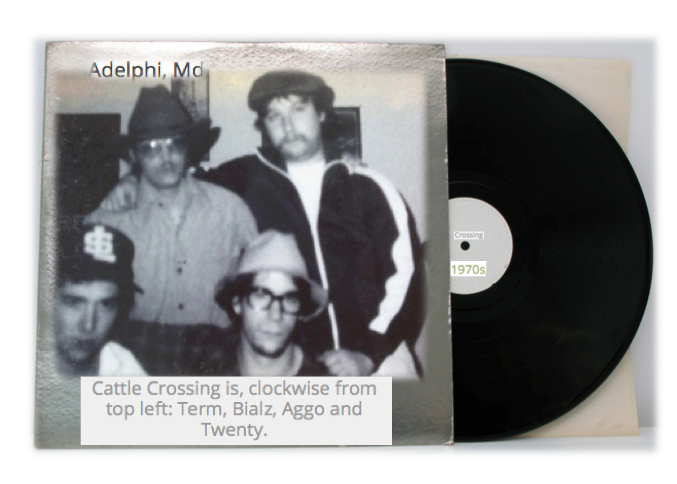 That Cattle Crossing vintage photo is awesome, Chum! Groovy, indeed! I bet your covers are not grainy like this one, Rachel. 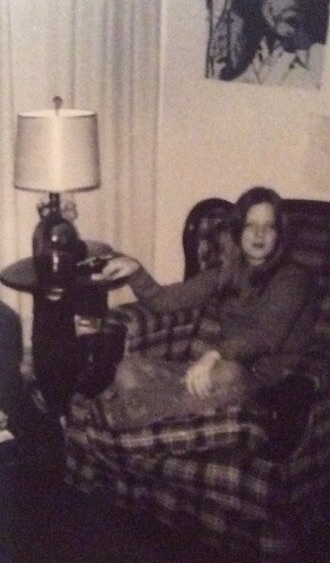 But it was 1978 and we were, well … young. 🙂 I am very percussive, Y.